Background: Pulmonary hypertension (PH) is a severe disease characterized by a progressive increase in pulmonary vascular resistance, initially due to abnormal pulmonary vasoconstriction in response to endothelial and smooth muscle cells injury. The discovery of new chemical entities having a protective effect on pulmonary artery cells could be meaningful for the treatment of PH. Methods: We evaluated the protective effect of DL0805 derivatives (DL0805-1 and DL0805-2) on pulmonary artery vascular cells, including human pulmonary artery endothelial cells (HPAECs) and human pulmonary artery smooth muscle cells (HPASMCs). DL0805 derivatives are novel ROCKs (Rho-associated coiled-coil forming protein serine/threonine kinases) inhibitors. Treatment of HPAECs with DL0805-2 (10 μM) cultured under a hypoxic environment could significantly reduce the proliferation of cells. Meanwhile, the compounds inhibited the production of reactive oxygen species (ROS) in HPAECs at every dose tested. Results: A Western Blot experiment showed that the protective effect of DL0805 derivatives might result from the down-regulation of RhoA (Ras homolog gene family, member A) expression and the inhibition of ROCKs activity. In addition, the compounds inhibited the proliferation of HPASMCs induced by fetal bovine serum (FBS) or platelet derived growth factor BB (PDGF-BB), and suppressed the F-actin remodeling induced by endothelin. Conclusion: The preliminary results from an immunofluorescence assay showed that DL0805 derivatives inhibited the activity of ROCKs in HPASMCs. The above mentioned results indicated that DL0805 derivatives have a protective effect on pulmonary artery cells, and the underlying mechanisms might be the result of inhibition of RhoA/ROCK signaling pathway. 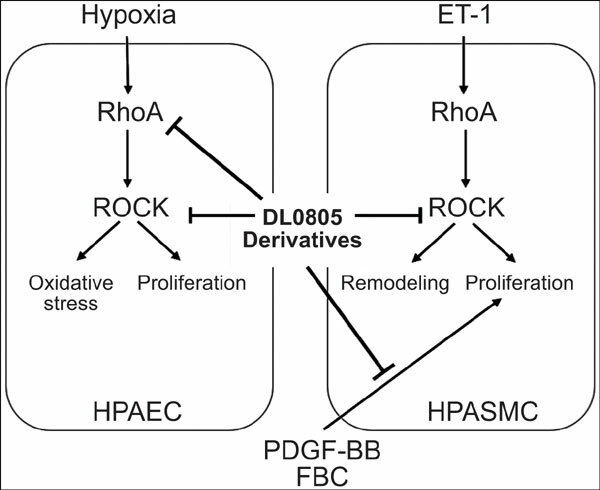 Keywords: DL0805 derivatives, HPAEC, HPASMC, hypoxia, proliferation, ROCKs. Keywords:DL0805 derivatives, HPAEC, HPASMC, hypoxia, proliferation, ROCKs. Abstract:Background: Pulmonary hypertension (PH) is a severe disease characterized by a progressive increase in pulmonary vascular resistance, initially due to abnormal pulmonary vasoconstriction in response to endothelial and smooth muscle cells injury. The discovery of new chemical entities having a protective effect on pulmonary artery cells could be meaningful for the treatment of PH.